An unconventional and memorable addition to your event - also available for feature concert performances and festivals. 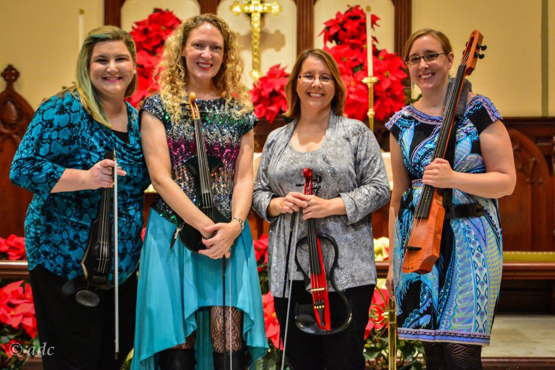 Anthem's electric string quartet has a contemporary look with rich acoustic-like tones from these modern instruments. Anthem Electric is a great choice for events where the sound needs to be projected (outdoors or in a large indoor space), though we can also keep the volume appropriate for background music. Anthem Electric's repertoire focuses mainly on our massive catalog of rock and pop arrangements from the 1960s through present day - however, we can play anything on the electric instruments, including classical. For feature concert performances, we can also include narrative portions about the music and/or themed elements to the song selections. For schools/music students: "Strings Can Play Anything!" Discussion of career opportunities for string players outside the classical world. We can provide our own PA and sound engineer, for an additional fee. For venues who have their own PA system, we require 4 direct inputs and at least two monitors. We can also bring 4 small acoustic amplifiers with direct outs to be used as monitors.